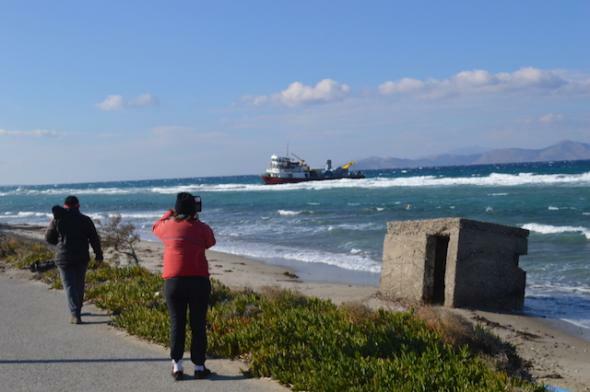 The Turkish offshore supply vessel Alcatras ran aground in Aegean Sea at the shores of Kos Island, Greece. The vessel, which was loaded with anti-missile system, was en route from Tuzla to Antalya, but stuck on 40 meters from the shore, pushed into the shallow by the strong wind and heavy seas. The offshore supply ship suffered breaches and some of the ballast tanks flooded, but there is no information about damage of the fuel tanks and oil spill. The Master of the ship Alcatras reported the accident to the local authorities, but part of the crew abandoned ship and swim to the shore. The situation around grounding is not fully clear, so Greek Navy sent a vessel at the accident site to monitor the condition of the ship, due to the specification of the cargo carried on board. 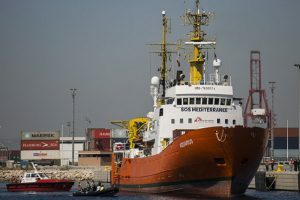 According to the Captain of the troubled ship, it suffered damages of the rudder and propulsion system, which caused grounding and stucking into the shores of Kos island. The offshore supply vessel was breached and remain stuck until weather improves. Fortunately there were no injured people and no reported water pollution during the grounding. The local authorities will detain the ship until further investigation. The navy patrol vessel is at the scene of grounding and monitor the troubled ship from the sea side. The Turkish-flagged offshore supply vessel Alcatras (IMO: 8730716) is operated by the company Kopmaz BS. The ship has deadweight of 160 DWT and gross tonnage of 204 GRT. The supply vessel Alcatras was built in 1991 by Turkish shipyard Ustaoglu Yacht and Shipbuilding.